Replacing missing teeth is vital as tooth loss may compromise speech and mastication function besides creating other problems such as Temporomandibular Joint Disorders (TMJ), facial sagging and low self-esteem. Dental implants may be considered as an effective option to replace falling or missing teeth. You may consider getting dental implants in Tijuana, Mexico if you seek a combination of quality care along with affordability. We at TJ Dental Center work with well-qualified and experienced oral surgeons. Dental Implants are titanium tooth roots which are used to replace missing teeth. They are surgically placed into the jawbone and allowed to heal for a period of 3-6 months. These artificial tooth roots are then topped with abutments and crowns/bridges/overdentures. Dental implants fuse with the jawbone and its surrounding tissue to provide stability without disturbing the adjacent teeth. When the tooth is lost, the lack of stimulation to the jawbone causes a decrease in bone density. As per the American Academy of Implant Dentistry (AAID), a dental implant stimulates bone growth and prevents its further deterioration. Sometimes tooth loss leads to wrinkled skin on the face which is not very pleasant to see. It makes you appear old and aged. Dental implants, on the other hand, support bone growth and make you appear younger. With loss of teeth you may have thought about dentures. But at times dentures do not allow you to eat what you want to. To add to the problem, they may also wobble and move from their position in the mouth. Dental implants do not move about in the mouth and are much more stable as they are surgically implanted into the jawbone. They help you regain your confidence and self-esteem1. You can laugh and eat as you would with your natural teeth. With dentures the roof of the mouth is covered which prevents tasting food. But implants do not have a palate thus making food chewing and tasting much more convenient. Chewing and speaking functions are immensely improved with dental implants1. Unlike you natural teeth, dental implants are not sensitive to hot/cold things. With regular checkups and proper oral hygiene, they can last a lifetime. 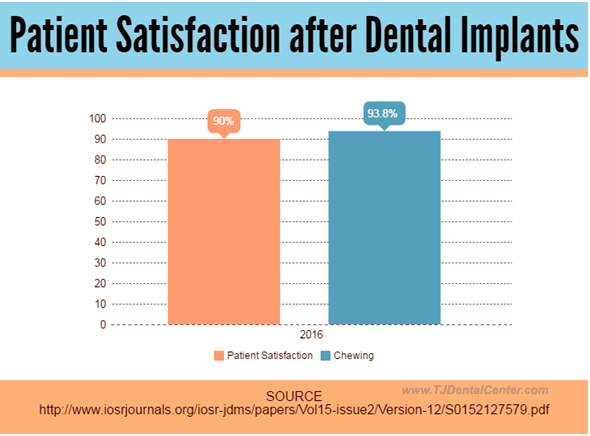 A study by Amel Salah Eltayeb and colleagues states 90% of the patients were satisfied with their dental implants treatment2. 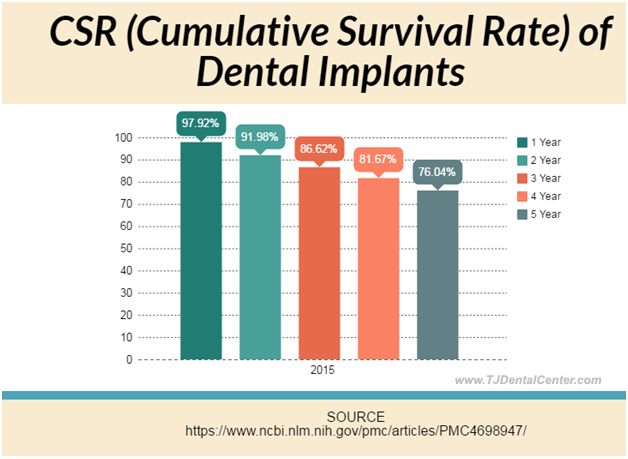 93.8% of the patients reported high satisfaction rates with chewing and gingival health2. Dental implants allow improved oral health. They do not get cavities. But care should be taken to clean around the implant surface. Dental implants are not visible on the outside. Nobody is able to make out whether you had implants or not. They closely resemble your natural teeth. You can get a new smile with single dental implant as well. You can brush and floss your implants just like you would with your natural teeth. Unlike dentures which have to be taken out during the night, dental implants can’t be removed. An easy home care routine accompanied with regular flossing and brushing is paramount. Fill in the contact form to know more on getting dental implants with TJ Dental Center. Why Choose TJ Dental Center for Dental Implants? We offer pocket-friendly dental solutions including all on 4 dental implants and all on 6 and 8 dental implants in Tijuana, Mexico. 80% of our clientele is from the USA. Our prices are much lower than the US cost. Tijuana is less than 20 miles from the San Diego International Airport (IATA: SAN) and can be easily reached. Read more about reaching Tijuana here. Once you reach the San Diego airport, we provide FREE pick-up facility from there to your hotel. How do I contact TJ Dental Center? You may be asked about your medical history or if you have been subject to any other surgery before. He may also ask you to bring along your x-rays and panoramic x-rays. If you are taking any medication, inform your surgeon in advance to avoid any last minute hassle. A single tooth replacement is often an option for individuals who have lost one tooth. No adjacent teeth are harmed or prepared while receiving this kind of implant. Because teeth are not subject to any kind of adjustment, the chances of decay or cavities is also lessened. All on 4 involves four dental implants in each dental arch to provide edentulous with a new set of teeth. Full arch replacement can be achieved with four implants which may not require bone grafting1. They involve placing six and eight dental implants in each arch. All on 8 implants requires enough jawbone to hold the implants. An overdenture or implant-supported denture is supported and attached to implants, whereas a normal denture is placed on the gums. The former are held on to implants through attachments which are specially designed. A dental bridge links the gap created by missing teeth. A bridge consists of two anchor teeth which have a false tooth in between. Dental implants as well as natural teeth both can support a dental bridge. Why Not Dentures? Why Implants? Although traditional dentures have certain benefits but they are not as suitable as dental implants. 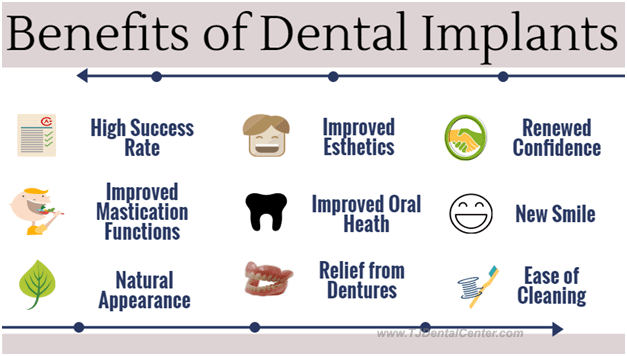 Let’s have a look at benefits of dental implants in comparison to dentures. Dental implants are fixed and cannot be removed They can be easily removed. They do not shift or wobble. They may shift while eating and speaking. They are surgically placed in the jawbone. They are fixed via adhesives. They preserve the jawbone. Do not preserve the jawbone. Can last a lifetime with proper care. They may need replacement after few years. Closely mimic the natural teeth. Do not look as natural as implants because of acrylic. Easy cleaning routine. Stringent cleaning routine to be followed. At TJ Dental Center, we believe in complete transparency about the treatments and their costs. We also aim to provide our clients with exceptional dental care so that they make an informed decision about their dental treatment. Fill in the quote form for more information.